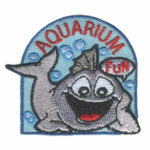 The Aquarium Fun patch from MakingFriends®.com is a great way to remember a trip to the aquarium where you learn about the great water world around us and how to take care of it. Take your troop on a tour at your local bagel shop. 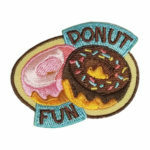 This cute patch from MakingFriends®.com is a great reminder of your trip. 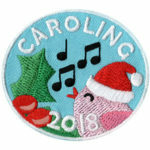 Caroling 2018 Patch — Close Out! 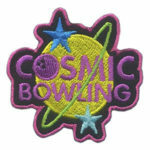 The Cosmic Bowling patch from MakingFriends®.com is perfect for your service unit event or troop trip. Take your girls on a tour of a donut shop or teach girls to make their own donuts. 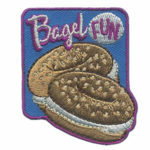 This colorful patch from MakingFriends®.com is sure to be a hit. 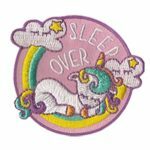 Younger girls will love this adorable Sleepover Patch with unicorn from MakingFriends®.com after your troop or service unit sleep over event. 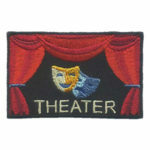 After a fun trip to see a show, your girls will love this fun patch from MakingFriends®.com. Help your troop learn how to make something out of wood. 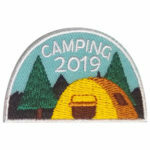 This patch from MakingFriends®.com demonstrates that your troop has learned how to use basic tools like a hammer, nails and sandpaper. 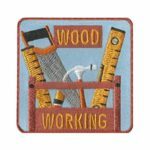 Older scouts might be ready to learn how to use saws, drills and more specialized wood working tools. Arrange a trip to a local hardware store or have a local carpenter visit so your troop or service unit to teach about safety, tools and even about careers in wood working.